Have you ever wanted to show off you amazing outdoor living space, home or office at night? Landscape lighting can be used to light up the front of your home or office, up light the canopy for large or small trees and light a pathway or landscaped areas. With our landscape lighting systems you will experience a beautiful soft white light from a fixture that is built to last. We offer a 3 year warranty on all labor and a 3 year warranty on materials. 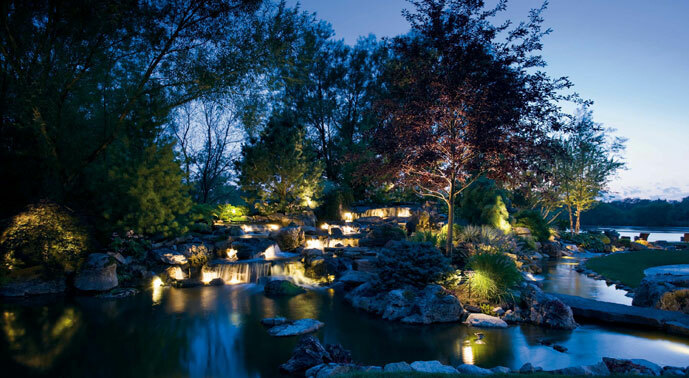 Our landscape lighting systems will deliver professional results for many years to come. Your landscape lighting system can be set to come on and go off at a specific time each night with a timer or photocell. The system can also be used to improve security with use of a motion detector. We mainly use Kichler brand lights and transformers but can install any brand if desired. Our low voltage LED lights use very little energy compared to the older conventional lighting. Styles include very basic lights to contemporary and detailed with many colors to choose from. Lights can be set in a visible location or hidden as to be unnoticed. Call Best of Texas Irrigation at (512) 260-1430 today to get a free quote. We also offer a discount for installing with a full irrigation system.